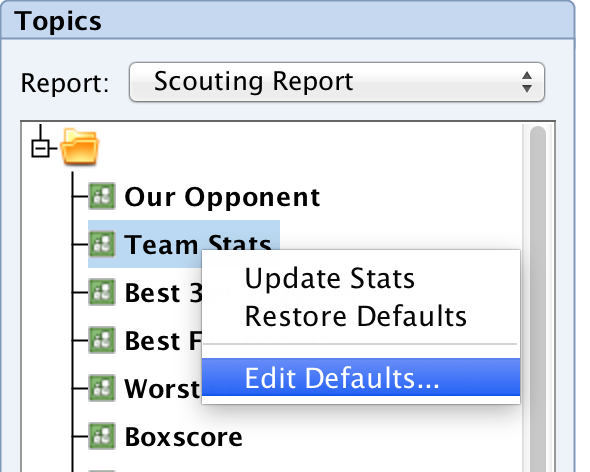 For the topics that you will be including in your scouting reports, you have the option to choose your default settings for topic, allowing you to normalize the appearance of each of your reports throughout the season. 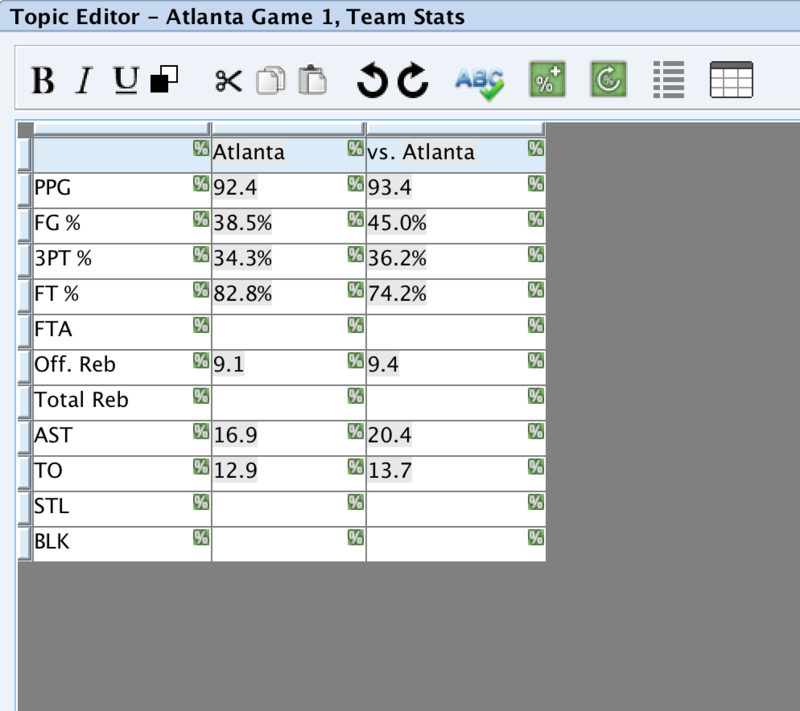 Your individual stats topics, such as Best 3pt Shooters and Best FT Shooters, can be modified to display as much or as little information as you would like. You can also edit the defaults for each of these topics so that they will be uniform for each scouting report that you create. 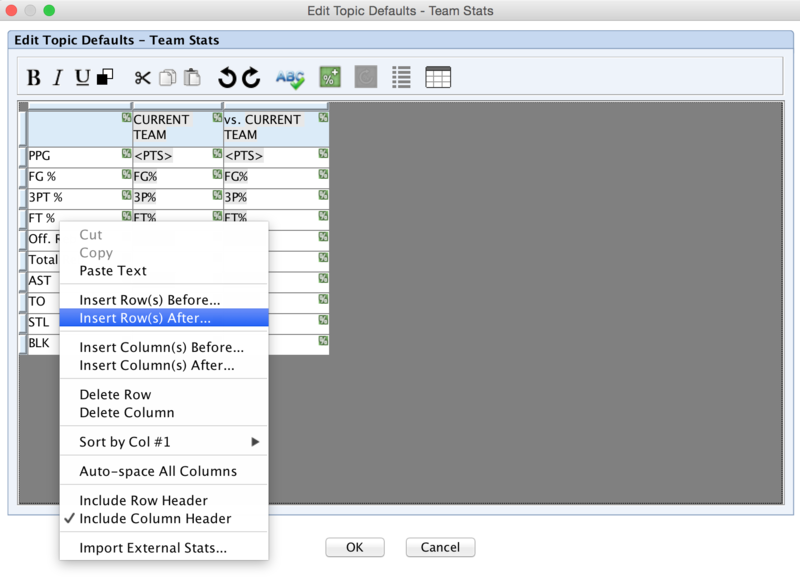 When you are working with your blank topic, you can add as many rows as you need by clicking the table icon in the top right corner and selecting Add Row(s) at End. As you are entering your data, you may find that you don't want to use all of the columns currently listed, such as %A 3PT. You can delete the column by clicking the bar just above the column to highlight it, and then you can right-click on the column. 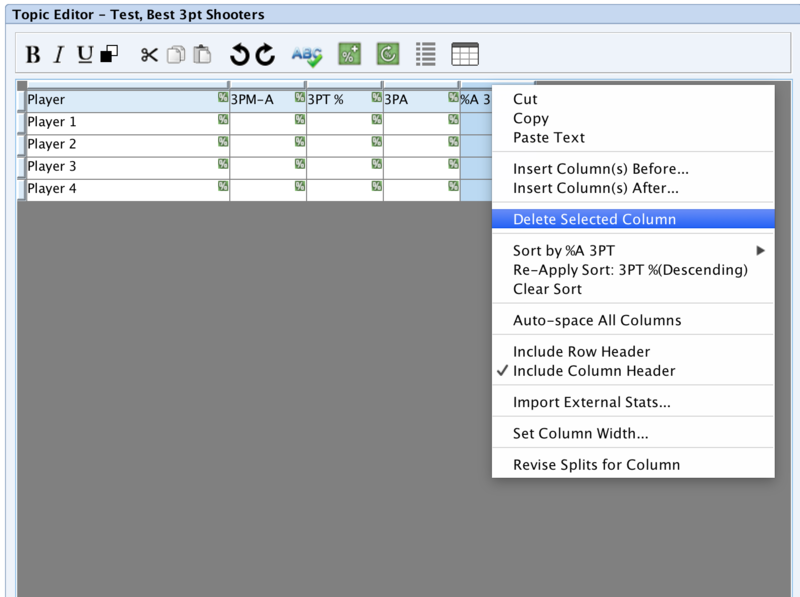 Select Delete Selected Column to remove it. 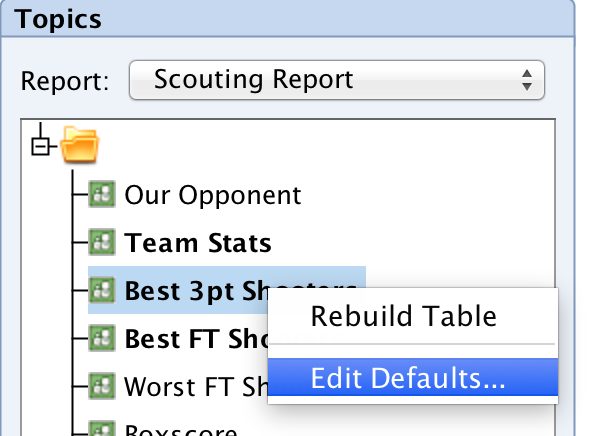 This step will remove the column for this scouting report, but when you create a new scouting report for a different team, that %A 3PT column will return and you will need to delete it again if you don't want to use it. Rather than deleting this column by hand for each report you create, you can choose to edit the defaults for this topic and make sure the column no longer appears in any scouting report. 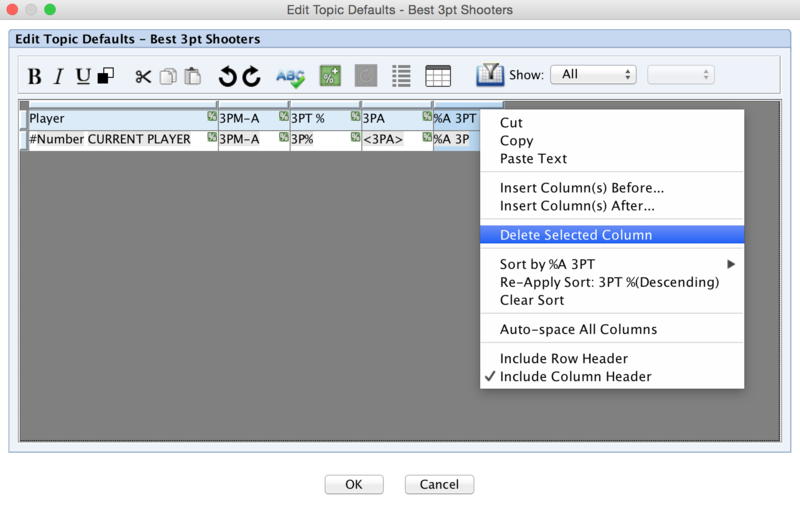 To edit the defaults, right-click the topic and select Edit Defaults. In the edit defaults menu, use the same technique to delete the columns that you do not want to show up in any report. Out of the box, FastScout gives you a wealth of different stats rows in the Team Stats topic to enter information about your opponent. Not all of these stats are tracked or available at all levels, however, so at some point you may want to customize the stats that are displayed in your Team Stats topic. To edit the Team Stats for just the current scouting report you are working on, you can remove or add rows within the topic using the right-click menu. To remove one or more rows, click on the Row Header (small box on the left side) to highlight the rows that you want to remove, and then right-click on one of the selected rows to bring up the right-click menu. From there, choose to Delete Selected Rows. If you would like to add an additional row that is not already present, right-click on any row and select Insert Row(s) Before or After, where you can select to add one or more rows above or below the row the you right-clicked on. 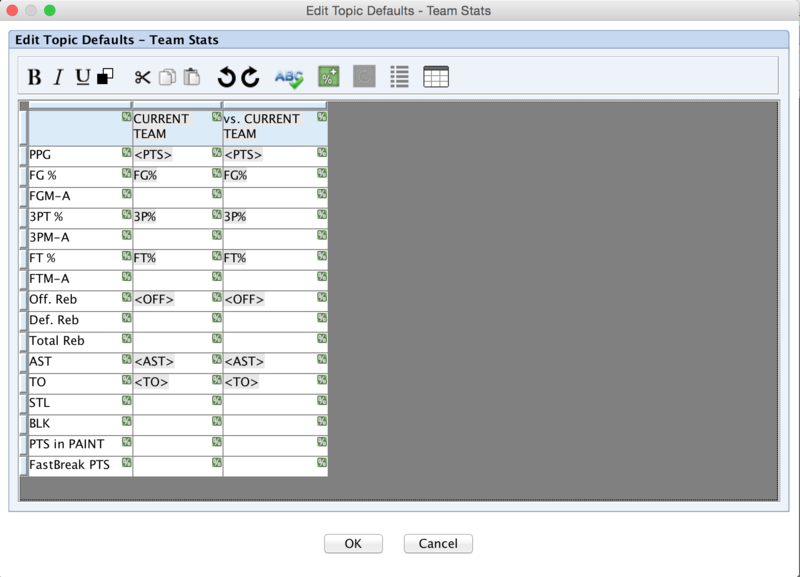 This is a quick and easy way to modify the Team Stats topic for your current scouting report, but for each scouting report that you create, the topic will revert back to the out of the box defaults and will list all of the rows that you already deleted. If you want to make universal changes that will affect each scouting report that you create going forward, make your changes to the Team Stats defaults by right-clicking on the Team Stats header, and then select Edit Defaults. 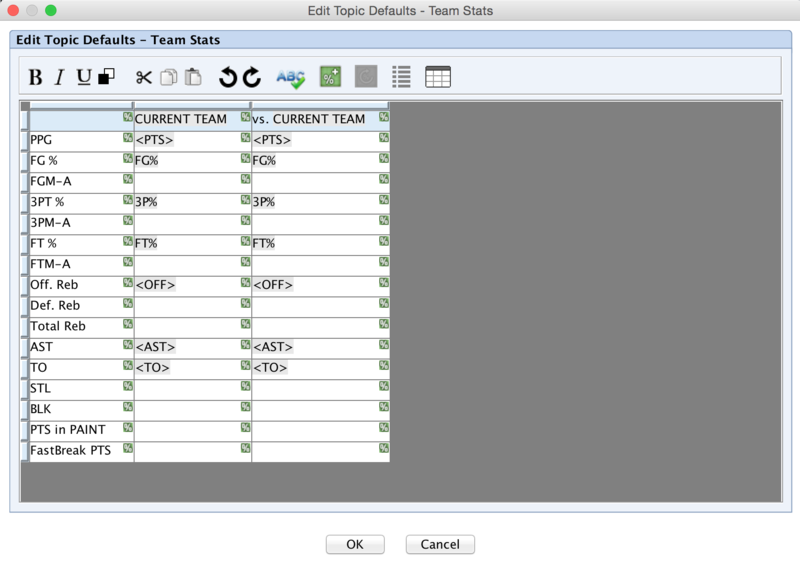 The Edit Defaults window will look similar to the regular Team Stats topic window. The columns in your Team Stats topic can be adjusted to the width that you would like to use each for each report by clicking and dragging the divider line between the columns left or right. 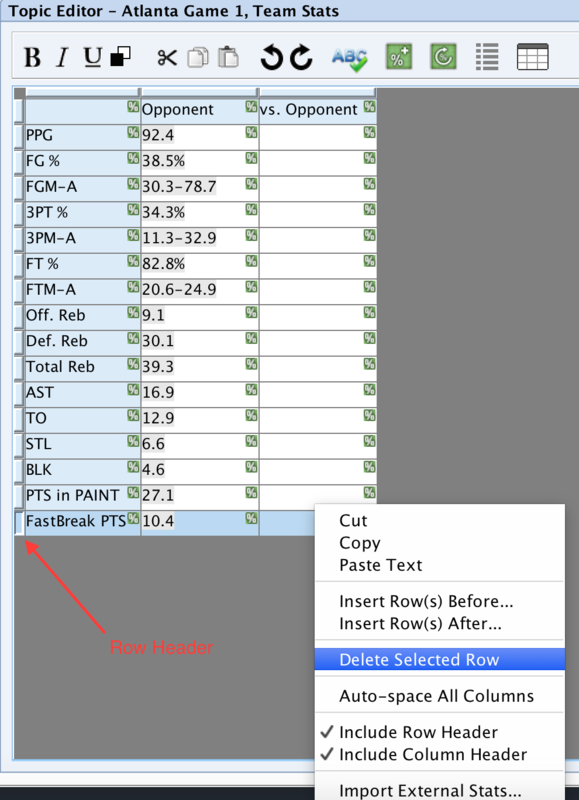 From this window, use the same technique as above to permanently delete any rows that you will not want to use in any of your scouting reports. 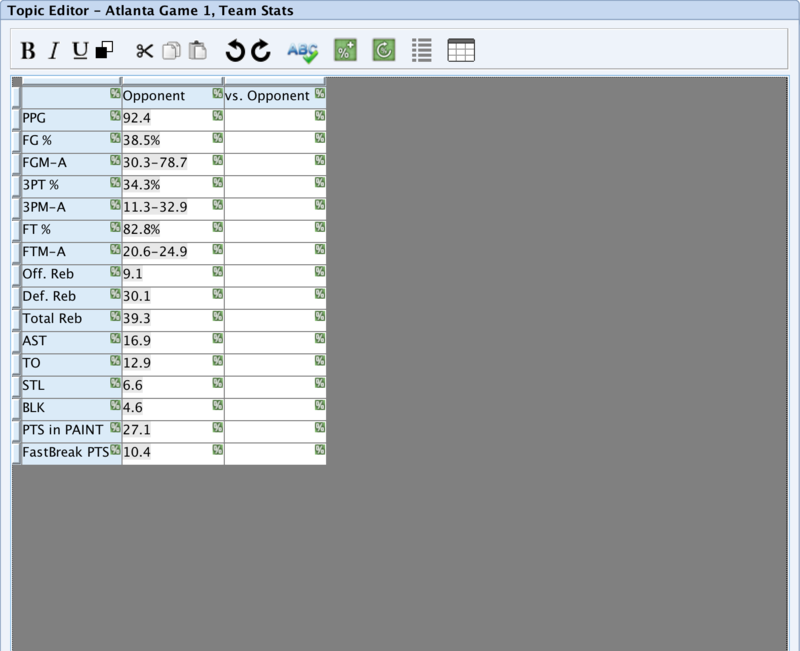 Use can also use the Insert Rows function described above to permanently add rows to your Team Stats topic. Once you are satisfied with your adjustments, click OK and you will receive the following message. Be sure to select Yes so that your changes will be applied to the current scouting report that you are working on. These defaults will also be applied to each new scouting report that you create going forward. 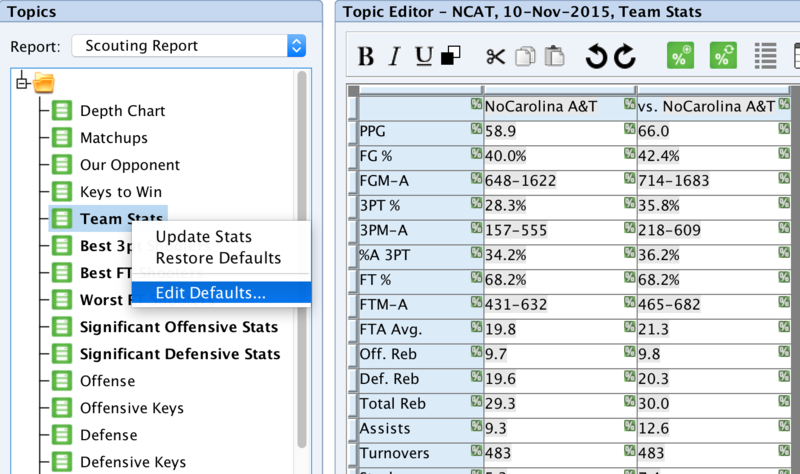 In each statistical topic within FastScout, the stat categories in each topic have a pre-defined setting in FastScout to populate the stat as a Total number or an Average per game number. If at any point you want switch from Totals to Averages, or vice versa, you will want to do so at the Defaults level, which will ensure that your changes will apply to each new scout you create going forward. 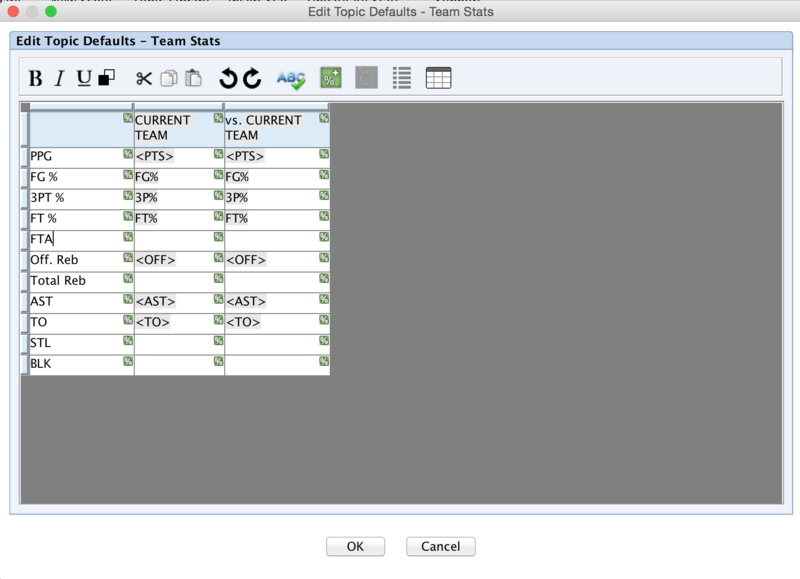 In this example, the Team Stats topic is used. If you are making changes to your Personnel, Starters/Reserves, or any other topic such as Best 3PT Shooters, you can follow these same steps to change your defaults. 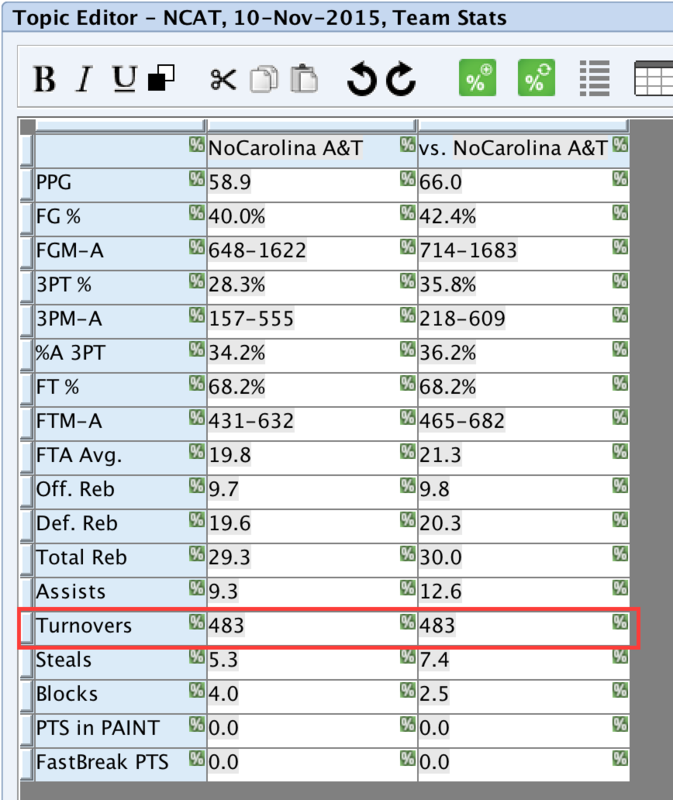 In the following Team Stats topic, the Turnover category is set to Total, so it is displaying the total number of turnovers for the season. If you would rather display the number of turnovers per game instead of the total number, you will need to open the Edit Defaults menu to make this change. 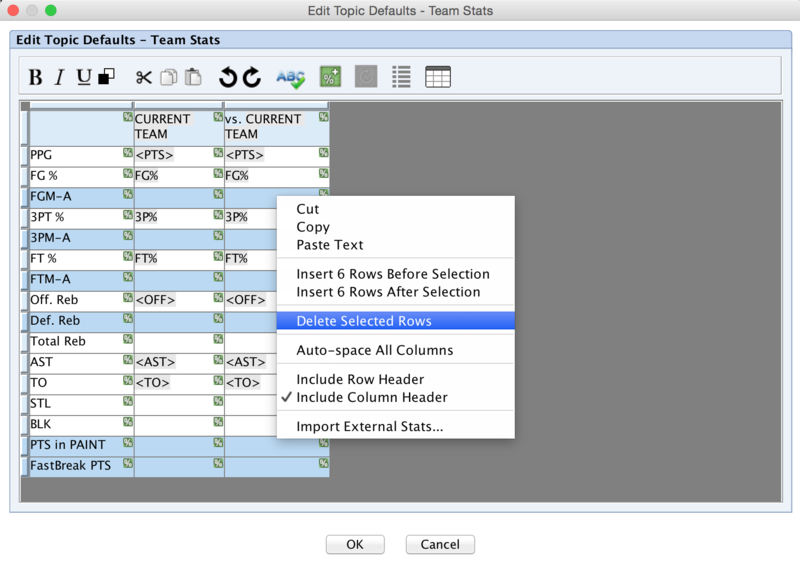 In the Edit Defaults menu, identify the Turnovers row, and then the cell containing value that you wish to change. 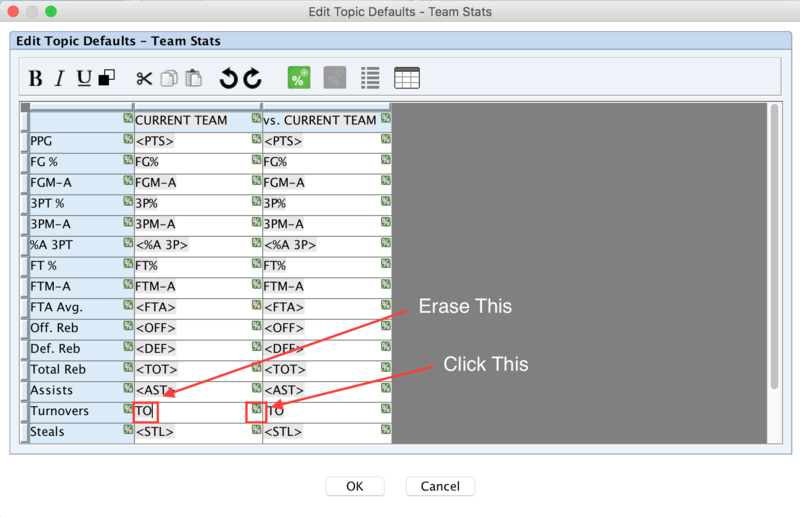 Because it is currently set to draw the Total number of turnovers, you will want to first erase the current value in the cell. After erasing the current value, click the green % icon to bring up the Insert Stat menu, which will allow you to select a new value to populate that cell. 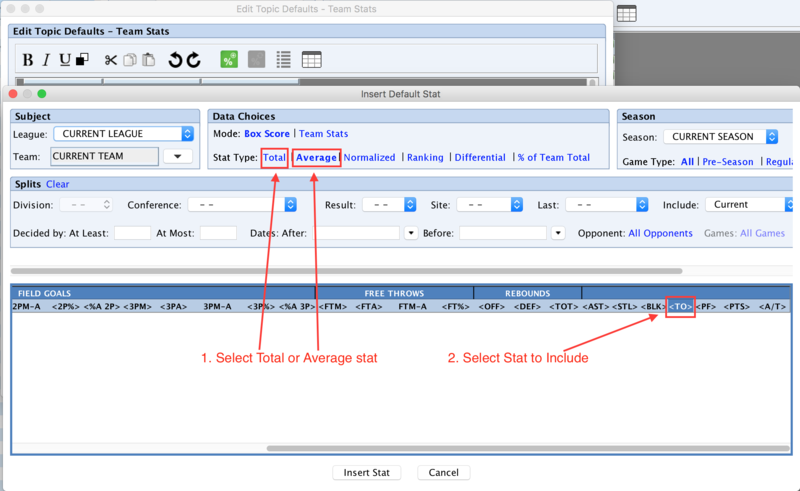 In the Insert Stat menu, use the Stat Type row to select between a Total or Average stat. If you want to use an Average stat, click to highlight the Average button. Once Average is highlighted, click the corresponding stat that you wish to include. In this example for Turnovers, you would select TO, and then click the Insert Stat button. After you have modified each stat that you wish to change, click OK to close the Edit Defaults menu, and you will receive a pop up message asking you to Restore your Defaults. Select Yes to see your changes reflected.